The HuCAL® antibody generation process can be tailored to select antibodies that are best suited for applications for use on a bead-based multiplex platform, such as the Bio-Rad Bio-Plex Multiplex System instruments, or other platforms using Luminex xMAP technology. As part of a custom antibody project, we can also use multiplex technology for the high-throughput screening of large numbers of antibodies in order to select the best pairs for immunoassays. When primary screening is carried out on antigen-coated beads, rather than antigens immobilized on microtiter plates, the likelihood of selecting antibodies suitable for use in applications on the Bio-Plex System, or other multiplex instrumentation is increased. The high-throughput screening is performed using antibody-containing E. coli lysates in 384-well format. The throughput is the same as for primary screening by ELISA, where the antigen is absorbed to the bottom of microtiter plates. Panning was performed on a customer supplied viral protein antigen coupled to Bio-Plex beads. Primary screening in 384-well format was performed on the Bio-Plex 3D Suspension Array System. One hundred and thirty nine antibody candidates were identified that showed binding to the bead-coupled antigen of interest but did not recognize two control antigens (BSA and a closely related viral protein), also coupled to beads. 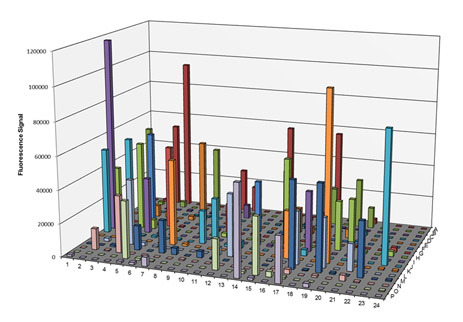 Figure 1 shows the results as a 3D column chart. Twenty hits were sequenced, 8 unique antibodies were found, and all hits were confirmed in quality control ELISA. Fig. 1. Results of primary screening using the Bio-Plex 3D Suspension Array System. 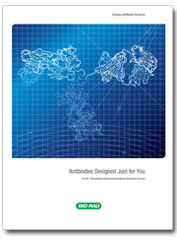 We have developed a method for automated coupling of HuCAL technology generated antibodies to Bio-Plex microspheres, enabling high-throughput identification of antibody pairs on the Bio-Plex 3D System. The multiplex nature of the technology enables identification and titration of antibody pairs simultaneously, on the same plate. Further confirmation of the pairs selected using the Bio-Plex System can be done using standard ELISA in microtiter plates, if desired. The multiplex nature of the Bio-Plex 3D System technology allows the simultaneous identification and titration of antibody pairs on the same plate. It is possible to screen 30 x 30 pairs as 10-point titrations per 384-well plate (Figure 2). Fig. 2. 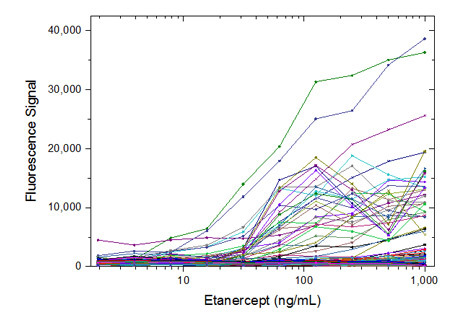 Ten-point titrations of 12 x 12 anti-etanercept antibody pairs using the Bio-Plex 3D System. Capture and detection antibody concentrations are kept constant, the etanercept antigen is titrated to generate a ten-point standard curve. Your technical sales specialist can guide you through the details of the service we offer, and provide a quote tailored to your needs.